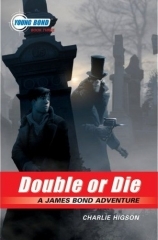 Amazon.com has finally posted the cover art for the upcoming U.S. release of Double or Die. Not due to be released till April 22, the cover art clearly features the work of Kev Walker who also did the cover of the U.S. edition of Blood Fever and is working on the Young Bond graphic novel series. I’ll tell you this much, I like it far more than the UK edition with the generic skull on the red background. I can’t wait to see the graphic novel really. SilverFin’s graphic novel is due on May 1 in the UK by Puffin. I don’t think a U.S. edition of that has been announced yet, though I’m sure it’ll come at some point. Thanks to the Danger Society. I agree. A vast improvement over the UK cover. From the moment Charlie first told us YB3 would be “set in the darkest corners of London,” this was the cover I saw in my head.